The Optimus Red sound level meter is for measuring sound levels in factories and other work environments in line with the UK and EU occupational noise regulations. Let the meter take the strain - The Optimus Red has been designed specifically for noise at work measurements. Rather than being a general purpose meter that leaves you trying to select the correct measurement range and parameters, the Optimus Red does it all for you, measuring all the measurements that you might need now and in the future. Lower cost meters are available (even within our range), but they will not usually meet the IEC 61672 standard and will not be Integrating as required for occupational noise measurement. They will certainly not be so powerful or easy to use. The noise at work regulations state that you should use at least a Class 2 Integrating Sound Level Meter that provides you with measurements of LAeq and LCPeak. The meter should be verified by a suitably equipped laboratory when new and at least every two years. You also need a Calibrator to check the meter's function before and after making measurements. 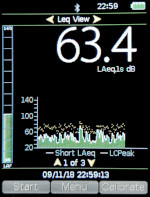 The meter's display shows the main parameters that are needed when making noise at work measurements: LAeq (average sound level), LCPeak (maximum peak level) and the current sound level. With a button push or two, it can also show more detail, such as LEPd, exposure, memory and calibration status. 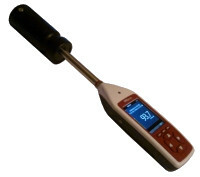 The Optimus Red was designed specifically for noise at work measurements in line with the EU regulations. It provides all the noise measurement parameters that you need in a meter of the correct grade. The meter will start measuring the LAeq and LCPeak (the main parameters needed for Noise at Work), along with a few other useful parameters. When you are happy that you have measured for long enough (the LAeq has settled for example), simply press the Stop key. Many occupational noise regulations recommend a second calibration check, at the end of the measurement process. This ensures the meter's performance hasn't difted since the start. When sound levels are found to be high, you must now calculate worker noise exposure. This is done using the measured LAeq and the length of time the worker is exposed for. There are not too many options for the Optimus Red sound level meter, as even the basic model includes all the parameters that you need for noise at work measurements in line with the EU directives. The data logging and octave band options can be added at a later date without having to return the meter, so you can decide later if you are unsure at the moment. Class 1 or Class 2? - The noise at work regulations say Class 2 is adequate.